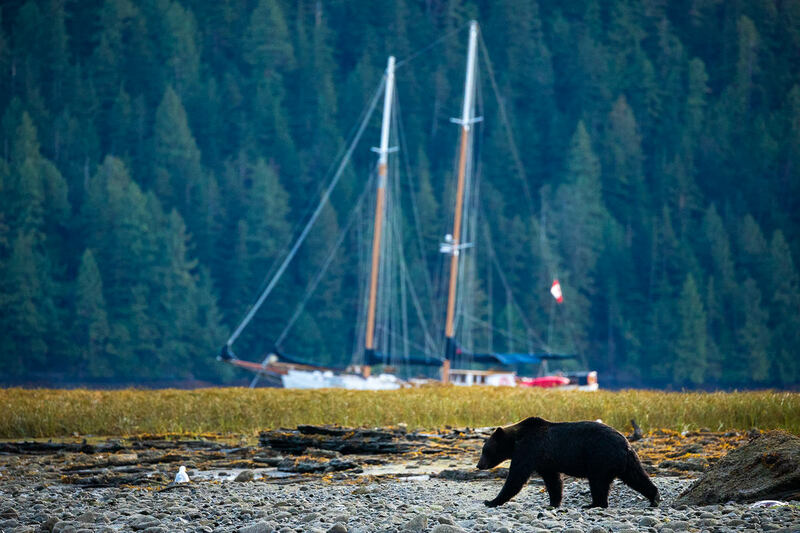 A grizzly bear walks a shoreline in BC’s iconic Great Bear Rainforest. A sailboat operated by wilderness tourism company Maple Leaf Adventures is anchored in the distance. Conservationists with the Ancient Forest Alliance are celebrating a recent resolution by the Wilderness Tourism Association of BC (WTABC), representing 2,500 businesses across BC, calling on the BC NDP government to protect the province’s endangered old-growth forests, support First Nations sustainable economic development, and ensure a sustainable, value-added, second-growth forest industry. The Wilderness Tourism Association joins thousands of businesses (BC Chamber of Commerce), mayors and city councils (Union of BC Municipalities), First Nations, unions (the Public and Private Workers of Canada forestry union) and conservation groups across BC in calling on the provincial government to increase protection for BC’s endangered old-growth forests. 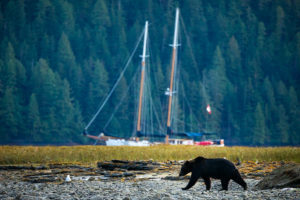 “BC’s business community is starting to realize that, far from hampering development in rural economies, many of which are suffering from decades of decline in forestry jobs and revenues, protecting old-growth forests can be a boon for business,” stated AFA Campaigner and Photographer TJ Watt. Port Renfrew on western Vancouver Island is a textbook example of the benefits of big trees to small businesses. Since Avatar Grove, an exceptional grove of ancient forest, was protected in 2012, the town has seen a major increase in revenue in rental accommodations, restaurants, grocery, stores, and other businesses, as visitors come from around the world to experience the grove and nearby record-sized trees. Communities across the province stand to benefit from protecting nearby ancient forests. In fact, studies have shown that keeping old-growth forests standing can provide a greater overall economic benefit than cutting them down when factoring in their value in supporting tourism, recreation, carbon offsets, water conservation and filtration, recreational and commercial fisheries, and non-timber forest products (e.g. wild mushrooms and medicinal herbs). Old growth forests are integral to British Columbia for ensuring the protection of endangered species, climate stability, tourism, clean water, wild salmon, and the cultures of many First Nations. At present, over 79% of the original productive old-growth forests on BC’s southern coast have been logged, including well over 90% of the valley bottoms where the largest trees grow. Only about 8% of Vancouver Island’s original old growth forests are protected in parks and Old Growth Management Areas. The Ancient Forest Alliance is calling on the NDP provincial government to implement a science-based strategy to protect BC’s endangered old-growth forests; support First Nations land-use planning and sustainable economic development and diversification in lieu of old growth logging; ensure the sustainable logging of second growth forests (which now constitute the majority of forest lands in southern BC); and implement regulations and incentives for the retooling and development of BC mills and value-added facilities to handle second-growth logs. The BC Chamber of Commerce, BC’s premier business lobby, representing 36,000 businesses passed a resolution in 2016 calling on the BC government to increase protection for BC’s old-growth forests to benefit the economy after a series of similar resolutions passed by the Port Renfrew Chamber of Commerce, the Sooke Chamber of Commerce, and the WestShore Chamber of Commerce. The Public and Private Workers of Canada (PPWC), representing thousands of forestry workers across BC, passed a resolution in 2017 calling for an end to old-growth logging on Vancouver Island and an accelerated transition to a sustainable, value-added second-growth forest industry. Both the Union of BC Municipalities (UBCM), representing the mayors, city and town councils, and regional district councils across BC and the Association of Vancouver Island and Coastal Communities (AVICC), representing Vancouver Island local governments, passed a resolution in 2016 calling on the province to protect Vancouver Island’s remaining old-growth forests by amending the 1994 land-use plan.